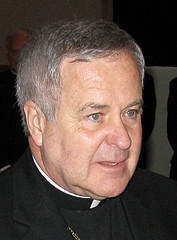 Archbishop Robert Carlson of the Archdiocese of St. Louis. The Archdiocese of St. Louis is taking the unusual step of reaching out to potential victims of an allegedly sexually abusive priest who has been dead for nearly a half-century. The Rev. John Wieberg was ordained in 1918 and served at parishes in Advance, Charleston and Arcadia in southern Missouri, and Josephville in St. Charles County, through 1961. He died in 1963. The archdiocese says several people came forward with abuse allegations against Wieberg that have been deemed credible by an archdiocesan review board. Officials say they don't normally make announcements about allegedly abusive priests who have died because the priest can't defend himself. But Archbishop Robert Carlson says he wanted to give any other potential abuse victims the chance to come forward and seek healing.